Rabcat was established in 2001 and is based in the city of Vienna, Austria. It started out working in game-based graphic design with a range of companies including Walt Disney, the Microsoft Game Studios and Rockstar Games. More recently, Rabcat has moved on up to top class i-games. Click here to read more. In addition to producing high-quality online casino games, Rabcat also makes video slots and poker, casino table games, and various other gambling applications. Rabcat is involved in the very popular multichannel platform win2day, which is operated by Casinos Austria AG and Austrian Lotteries. What Kind Of Games Does Rabcat Make? Rabcat produces a wide range of games, all with great animations and graphics. Some are fun and playful, but many have a dark and threatening feel to them. Their games work across virtually all the platforms and are supported in Flash and HTML5 formats. A notable feature is the number of languages supported by Rabcat games. Many games support as many as 20 different languages, making them accessible around the world. Rabcat games boast high-quality graphics thanks to back-end platforms such as Quickfire and Odobo, and they are working with Microgaming on a new range of slot games. What Is Different About Rabcat Games? 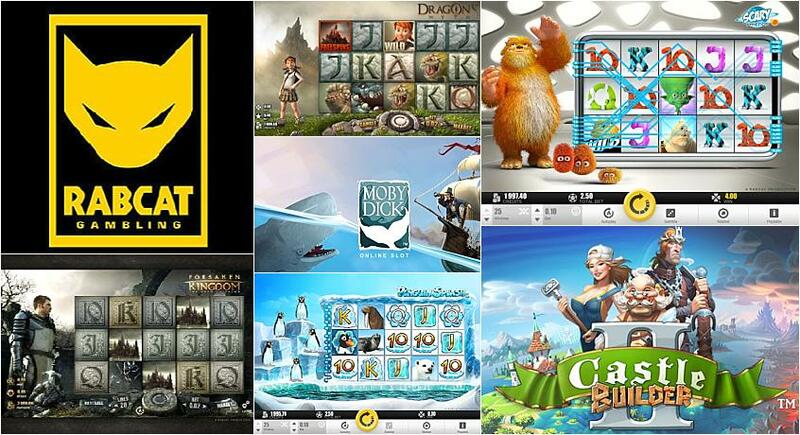 Some of Rabcat’s most popular games feature progressive elements on top of basic game play. When you play Castle Builder, for example, you’ll have a unique gaming experience as you collect symbols to build three castles, add houses in the country and erect forts to protect your kingdom. In Forsaken Kingdom, the goal is to put together a circular stone throughout the game using scatter symbols. When you’ve got the whole stone completed, a big bonus wheel will increase your winnings. The graphics in a Rabcat game are second to none and are coupled with integrated sounds to enhance the gaming experience. Playing Dragon’s Myth, you’ll find a dragon-hunting wild woman down the left of your screen reacting to every spin. When the dragons are lined up in a winning payline, you’ll see a stunning animation that will take your breath away. In the feel-good Penguin Splash game, a group of penguins hop and jig about on an iceberg to celebrate your success. Similarly, King Arthur watches on from the sidelines while you play the dark game Forsaken Kingdom. All of Rabcat’s games are comprehensively tested for your security, and the games are licensed to ensure maximum fairness. Rabcat mixes up the features, combining the more usual free spins, bonuses, wilds and multipliers with a new wave of elements that you won’t find in other games. These modern elements include leveling, individual play achievements and interactive features for you to click on, which all enhance the gaming experience. Throw in a whole load of fixed wilds and free spins in River of Riches, and you’ll be happy for hours. Some of Rabcat’s most popular games include Scary Friends, Forsaken Kingdom: The Path of Valor, Castle Builder, The Legend of Olympus and Dragon’s Cave.